Before my current USPS carrier (who always calls me early to tell me she has a package for me), the previous UPS carriers would put a salmon-colored "attempted delivery" notice in my mail box if it was too big to fit in the box, and I would go to the post office to pick it up. That rarely occurs now and most of the other carriers just leave it at the door and usually knock, too. But some don't as in the recent package which was stolen. Why the USPS carriers don't use the "attempted delivery" notice more often is odd because it would solve the problem for the customer and USPS if packages were never stolen. As I recall, an attempted delivery, aside from an over-sized package that won't fit in the box, is really only for stuff that needs to be signed for. Some carriers might try again and leave another note, or after one attempt leave it at the location where they work for you to pick up. Why these assholes are putting packages on the doorstep in beyond me. I'd never have done such a thing. Set up a booby trap in a fake package and have a live feed camera fixed discretely in the mailbox. You will at least have a face pic captured and report that to the cops. Was IN MY SECURE MAILBOX TODAY when I went out to get my mail!!!!!!!! No explanation, other than possibly the mailman scanned it yesterday as delivered, but somehow it was taken back to the Post Office, discovered there last night and then sent back out for re-delivery today. WHATEVER, I am HAPPY to have my package. I guess I just really can't explain anything anymore in today's world. If anything, this all is teaching me to be patient, accept the way things happen in the world and what will be, will be. I can hear my dear Papa singing "Que Sera Sera" in his beautiful Italian accent! Just amazing. Maybe someday the Post Office will actually figure out what it and it's employees are doing. Until then I guess all we can ever do is "Cast our Fate to the Wind". But dang I love that song! Play it Vince and Trio! Another Happy Ending. Good for you Zooba ! 1. Laziness. 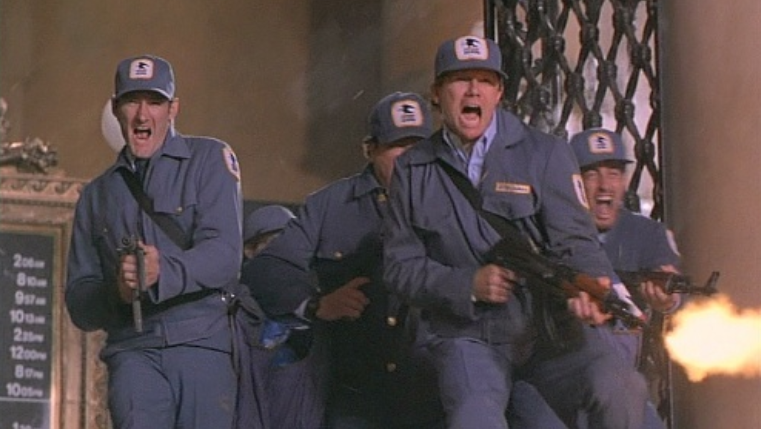 The postman is scanning all the packages in advance or in groups as time permits and when he forgets one or runs low on time, he simply isn't bothering to deliver. 2. If it's anything like where I worked, what you have is a three-sided square with slots for each house in that postman's delivery area. The mail comes pre-sorted in delivery order from a sorting facility and the postman so the postman just pops the right mails into the right holders. Then he has card markers indicating packages, which he puts into the front of the mail in the slot for the address the package goes to. Some postmen are lazy, or a supremely stupid supervisor told me to do, just shove mail into the slots randomly, so in other words: I no longer knew where the addresses began so I could leave the card markers and thus would miss deliveries, which counted against me in the end! I think a certain someone owes the entire UNITED STATES POSTAL SERVICE an apology. All 500,000 employees. What's the deal with postmen leaving packages and mail on people's doorsteps? Is this common in the US? I don't know about the US but it's very common in the UK. In theory if an item is too large to go through the letter box, the postman (I say postman because I've never, ever, seen a postwoman!) should leave a card to say the item can be collected at the local sorting office. In practice the postman will frequently leave large packages for me outside my front door. I've never had one go missing though. The package that was reported by Tracking as delivered to: IN MAILBOX/AT MAILBOX at my address yesterday that was not there yesterday... Was IN MY SECURE MAILBOX TODAY when I went out to get my mail!!!!!!!! Our friends use package services (like Mailboxes Etc.) as a delivery point for big or important packages. Not sure if you have them or something similar out there. We've had to moan at the local sorting office a couple of times when instead of ringing the doorbell, the postman slipped the card through the door and practically tiptoed away without making any attempt to deliver a parcel. There was someone in the house both times to witness it, and we came to the conclusion that one of the posties was actually leaving the parcels back at the depot because they couldn't be arsed to carry them around. Hasn't happened for a while. Contract delivery companies tend to hide a parcel somewhere if they can't deliver it and write on a card "behind the flower pot" or "just below the statue of Zeus between the ornamental fountains and the tennis court". The former is more likely, in all fairness.